The color light machine is a system of fixtures, gels, dimmers, and cords to use in classroom activities to demonstrate various properties of light, color, and color mixing. The fixtures, gel frames, and gels in the prototype were purchased at Little Stage Lighting Company in Dallas. The other components were purchased at a hardware store. The total cost for the system (in 1982) was $410.00. All electrical components in the system operate on 120 volts. Each fixture has a 250 watt General Electric Quartzline light bulb lamp, a 52" cord with ground cable and three-prong plug, and a 6.5" x 11.5" wood base. Each of the three units has a frame holder that will accept 6.5" frames or an extension unit that has a focusing system, a pattern or gobo slot, four shutters for altering the size of the light beam, and a frame holder that will accept 4" frames. There are four 6.5" frames with one each of blue, green, red, and yellow; four 4" frames with the same four colors; and three sets of gobos, each consisting of round holes decreasing in size from 1.75" to .5". Three dimmer controls each capable of handling 600 watts (no more than 2 of the light fixtures), four 3-prong female outlets (1 wired to each of 2 dimmers and 2 wired to the third dimmer), one 3-prong male outlet, and mounted in a 13.5" x 7" x 1.75" wood box. Four electric cords, each 15 feet long, each capable of carrying 1625 watts, with a 3-prong female plug on one end a 3-prong male plug on the other. One multiple plug with three 3-prong female outlets and one 3-prong male outlet. 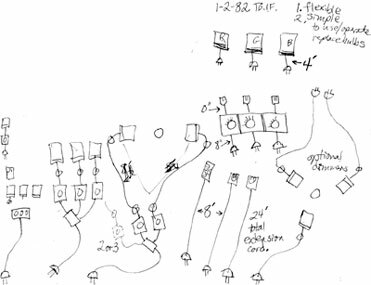 These sketches show some of the many possible configurations of the components of the system. The separate cords, plug, and control box allow for a variety of uses and configurations. The total cord length is 60' to allow for convenient placement of the light fixtures. The fixtures can be positioned to aim in any direction and can sit on any flat surface. All plugs are standard household 3-prong plugs' there are a minimum of parts, and the light fixtures are on flat bases. The gel frames, gobos, and shutters are easy to manipulate. The dimmer controls are color coded and calibrated for easy positioning. The lamps have standard size screw-in bases for easy replacement. The entire system, except for the three light fixtures, can be packed into a 12" x 12" x 18" cardboard box. The color light machine can be used for a variety of activities in the art or design classroom. Creative teachers can explore even more possibilities than the examples listed here. Show each of the three primaries as the eye perceives it. Show primaries overlap, control intensity, create colors of the spectrum. Same as above but shine the beams onto a rear projection screen. Using 3 gel colors, show mixing on moving object with changing faces and shadows. Use two or more gels in one frame holder. Show warm and cool colors on opposite sides of an object, some mixing in center. Show the effect of different colors on one object. Shine one color on wall/screen, change rapidly to white. Shine white light or mixture of 3 primaries through a prism. Show shadows on different textures and colors. Students create lighting and color effects using lights,gels,dimmers. 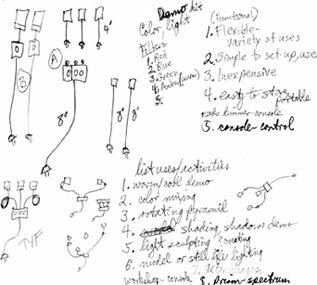 Use lights and gels to highlight human and still life models for drawing exercises.